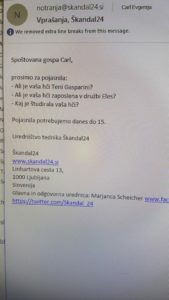 “Following media reports claiming that pro-Orban media companies have provided financial support to SDS (Slovenska demokratska stranka)-linked outlets and their election campaign, two journalists have received e-mails from one of the SDS-linked media outlets, Škandal24, asking questions regarding journalists’ personal life aiming to discredit them and their work in public and finally pressure them to drop the stories. 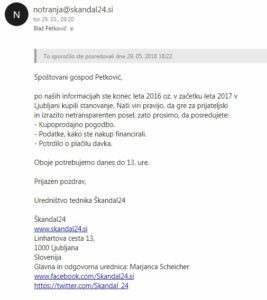 Večer journalist Blaž Petkovič has been asked to share his apartment purchase contract, disclose how he was able to afford the apartment and proof of payment of taxes. Please find attached the screenshot of the e-mail in question. RTV journalist Eugenija Carl has been asked to disclose the information on her daughter’s employment status (asking whether she is an employee of the Eles company) and educational background (asking what she studied). Please find attached the screenshot of the e-mail in question. Other journalists have also recently faced different forms of pressures, e.g. persistent calls from blocked or unknown numbers, letters and messages to journalists and their family members, banners insulting Siol media outlet hanging from an overpass (http://generacijaidentitete.si/wp–content/uploads/2018/05/32219162_10215825597169838_2481844665855246336_n.jpg, also covered and further disseminated by Nova24tv.si http://nova24tv.si/slovenija/politika/generacija–identitete–vraca–udarec–cirmanu–invukovicev–vasa–okupacija–lazi–in–manipulacija–siol–fake–news/). Following the vote, editor in chief of the newspaper Škandal, Marjanca Scheicher, announced that the printed edition will cease to exist, substantiating the fears that it was used as a PR tool during the electoral campaign.